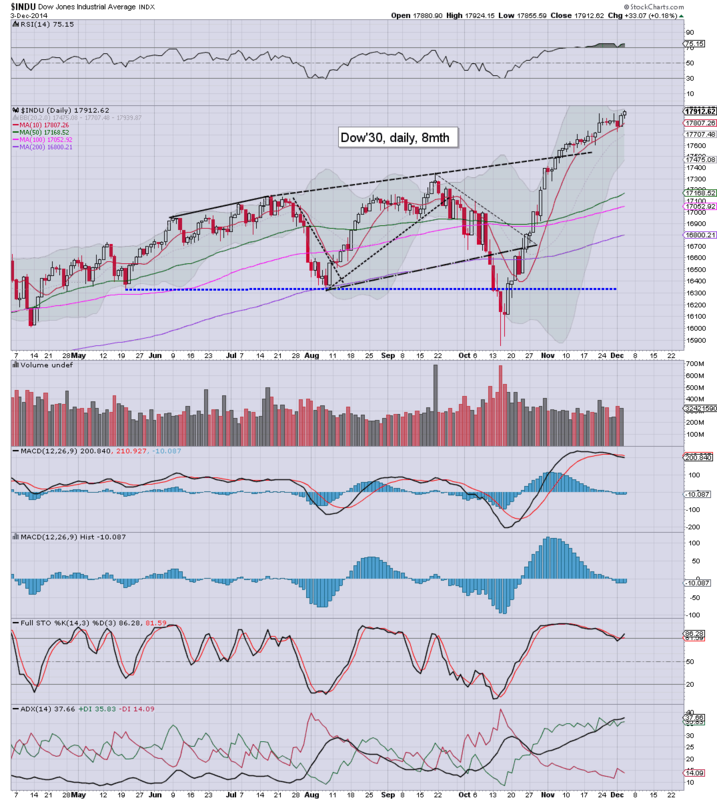 US equities closed a little weak, sp -2pts @ 2071, but with two new historic highs of sp'2077, and Dow 17937. The two leaders - Trans/R2K, settled lower by -0.1% and -0.5% respectively. 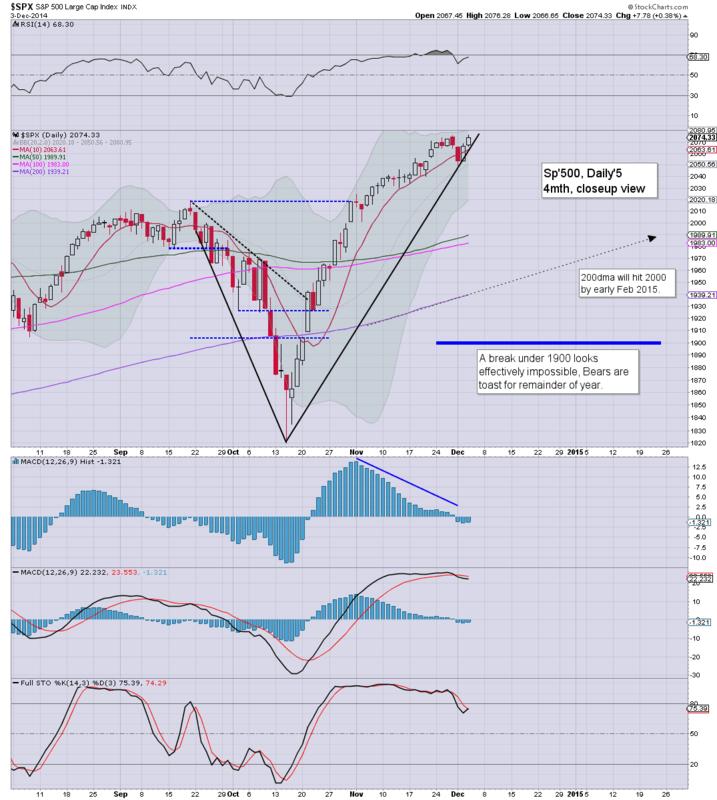 Near term outlook is mixed, but with Dow 18k and sp'2100s... seemingly due. So... early morning weakness.... to sp'2062... but then reversing.. to a new historic high a mere few hours later. It remains a nightmare of a market for those still attempting short term index shorts (or even worse.. VIX longs). I will have no part of it, with no intention to short the indexes until late 2015/early 2016. Regardless of the exact close, it has been another day for the equity bulls. 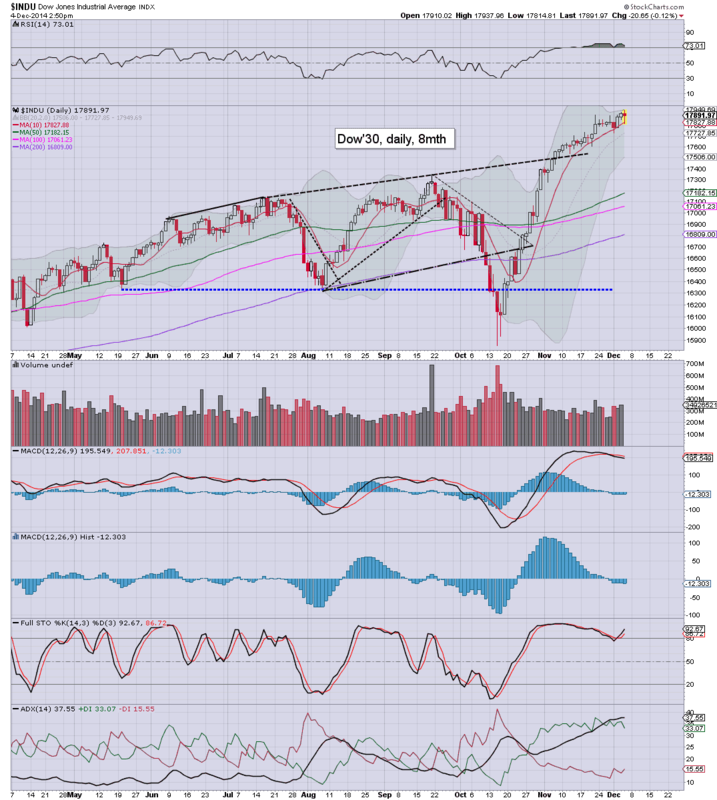 Not only was it the third consecutive daily new high for the Dow (17937), but the sp'500 broke a new high (2077). It remains unquestionably.. an increasingly twisted and bizarre market. *I'm not in the best of moods today, perhaps the fact that the weather outside, looks like a scene from a horror movie... yeah... that is not helping. So.. two new index highs. 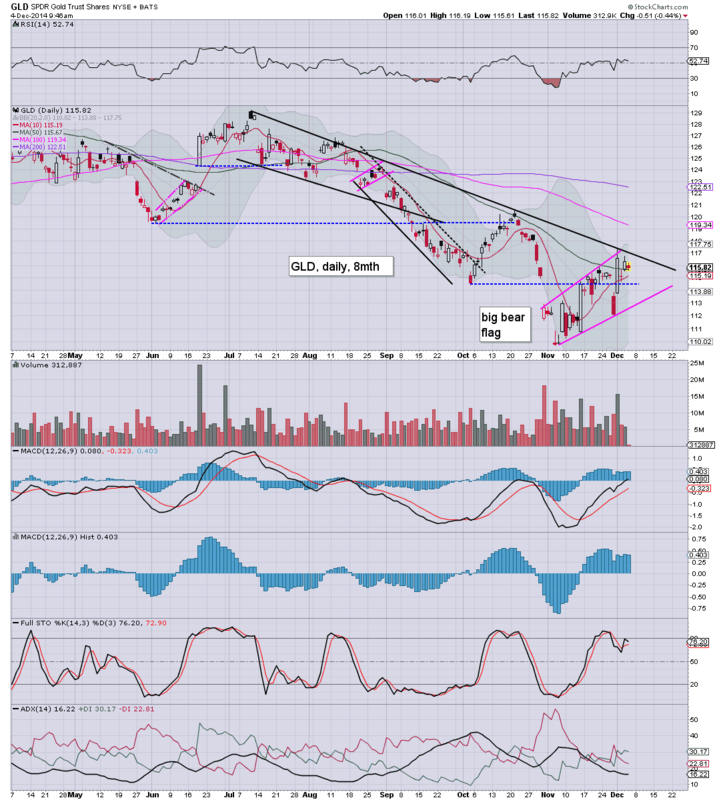 No doubt some will be highlighting the R2K as a '... see.. it has not yet broken a new high!.. it did NOT confirm... omg! Seriously... how can anyone still have the audacity to call for significant weakness. The Japanese.. along with other central banks are buying EVERY day. Hell, even the maniacs on Zerohedge were making some fine comments on that issue just yesterday, when it was revealed the CME will be continuing their 'special offer' to the central banks. Notable weakness.. energy stocks.... but more on that... on my 'fair value' page, after the close. The earlier moderate declines have been entirely reversed, with new historic highs in the Dow and sp'500. VIX has naturally turned red. Despite a weak USD, -0.3%, the metals are not able to push higher, Gold, -$3, whilst Oil is -0.9%. Truly.. utterly tedious... and with new historic highs, the bears are back to square one. 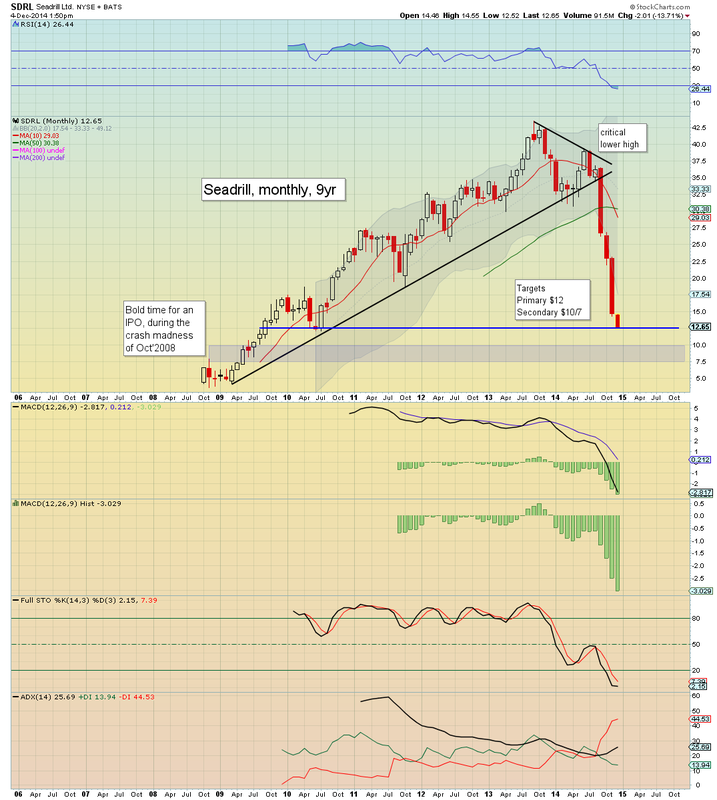 The monthly chart remains one of the biggest horror shows of the year.. I still like the company, but frankly, even at $10 in Jan/Feb... I ain't especially tempted.. not until Oil looks decisively floored. US equities remain moderately weak, with the sp'500 managing to slip -12pts to 2062. Energy prices remain exceptionally weak, Oil -1.3%, with Nat' gas -3.3%, which is naturally causing continued problems for the oil/gas drillers. *Another teasing morning to the bears, moderate declines... but just no real downside power to it.. as reflected in the VIX which is already in danger of turning red. I've been seeing the usual suspects start touting huge downside in spring/summer 2015... everything from the 'mere' sp'1600s..to even lower. Whether a minor retrace to 2020/15.. or even a brief foray to 2000/1980... it should make ZERO difference to anyone more focused on the bigger picture. I can't wait to see the bearish hysteria when rates are raised next year. Yeah.. 25bps is going to CRASH everything, right? US equities are increasingly weak ahead of the big monthly jobs data. Price structure is offering a micro double top of sp'2075/76. First soft target is the recent low of 2049, and then the 2020/15 zone. 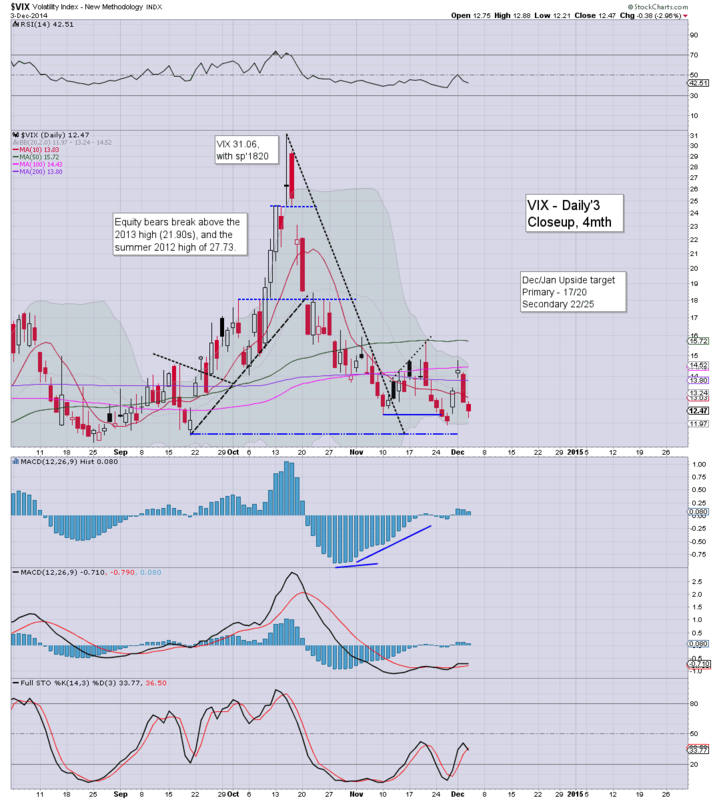 *vix is starting to reflect a little nervousness in market land. First target is a daily close in the 15s. A daily close <2049 sure would make things interesting for tomorrow, but yes. that is a long way down, and we've not seen a net daily decline of that amount since mid October. Oil remains weak, -1.4%, and that sure isn't helping energy stocks. SDRL -5% @ $12.55, effectively hitting my target. Considering oil prices.. $10 now a given... perhaps $7. Whilst Orion will remain on the pad for at least another day, US equities are a little weak. Metals are weak, Gold -$6. Oil is on the slide, -1.4%, in the $66s. 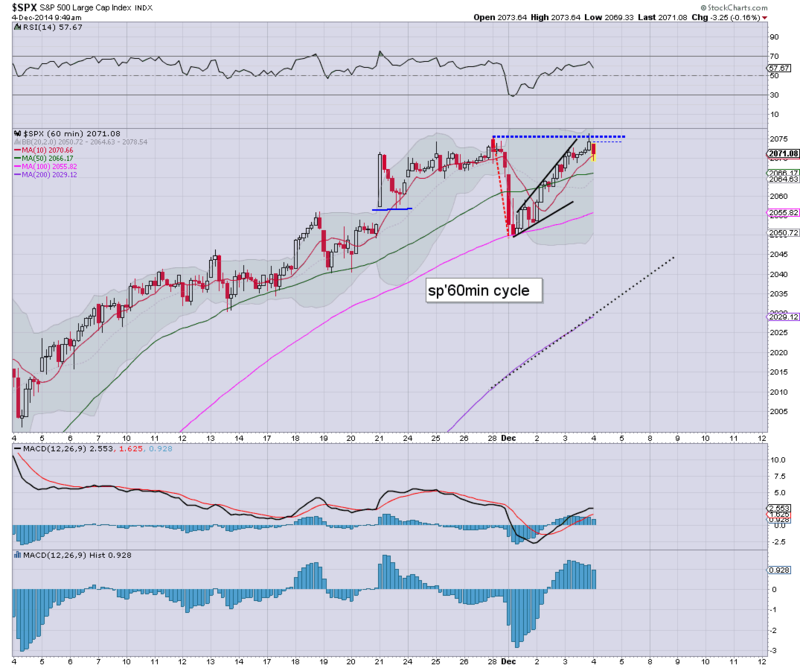 Whilst the Dow did make a notable (if marginal) new historic high in the previous two days, price structure on the sp'500 hourly cycle is offering an effective micro double top of 2075/76. 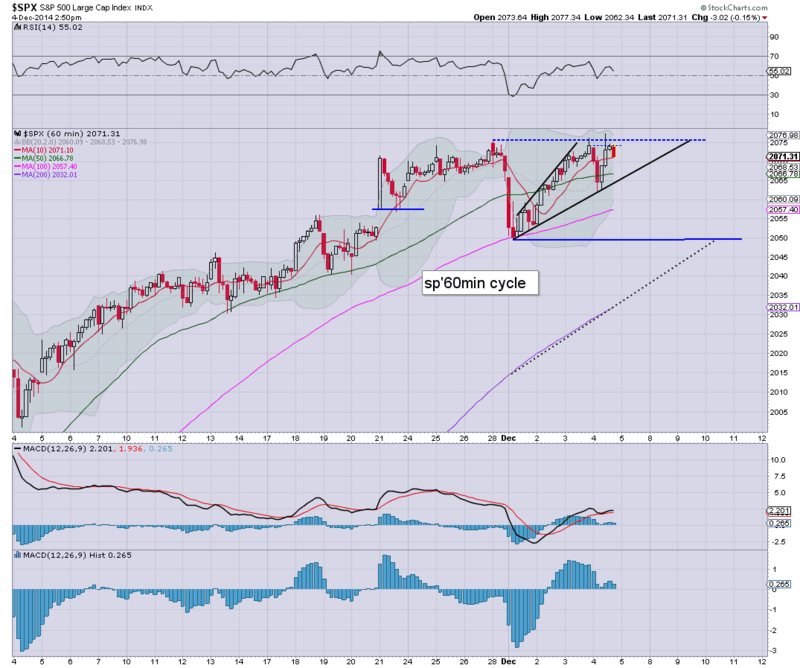 First downside target is the recent low of sp'2049. Daily cycle currently offers the lower bol' in the 2020s, but that is clearly out of range this week. All things considered though, a day of churn/chop is more likely than anything.. as Mr Market waits for the monthly jobs data..tomorrow. 10.32am .... Nat'gas report...draw down less than expected... $3.69.... no support until 3.30 or so. Main market.... weak....but still.. small moves. Noteable weakness, BKS -10%... as they break off from MSFT alliance on Nook. US equity futures are a little higher, sp +2pts, we're set to open at 2076. 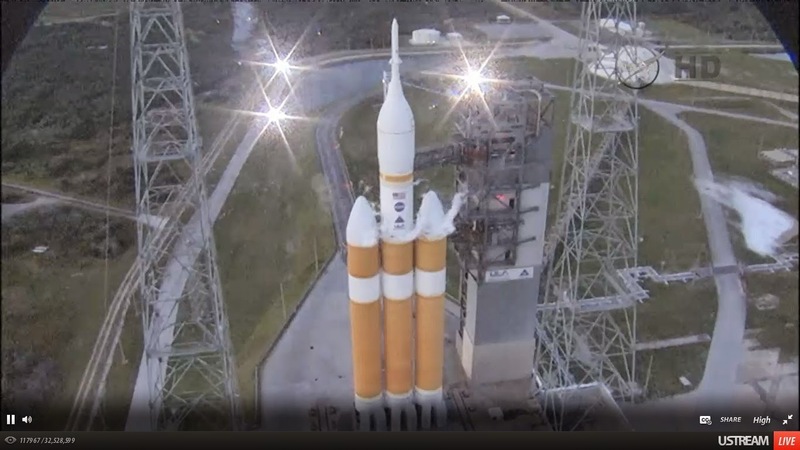 Meanwhile... on the pad in Florida, USA, the Orion vehicle is set to launch. Precious metals are weak, Gold -$6, ahead of the ECB announcement/press conf. Unless Draghi says something stupid within the next hour or two, the market looks set to churn ahead of the Friday jobs data. 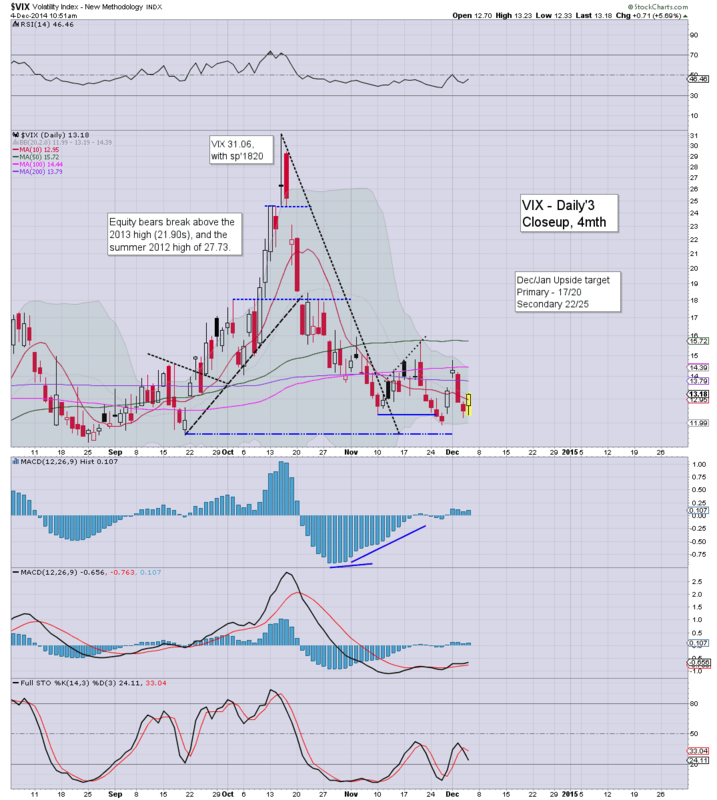 A weekly close in the 2080s, with VIX 11s looks very probable. After all, everything is 'fine', yes? I will be looking for particular weakness in the metals and oil, not least if the USD continues to climb, and take out the March' 2009 high of 89.11. It was just another day for the equity bulls, with notable new highs for the mighty Dow (17924) and sp'500 (2076). Market remains utterly calm and confident, VIX settling -2.9% @ 12.47. Broader trend remains powerfully bullish, Dow 18k, with the sp'2100s look due. Little to add.. on what was just another day of classic algo-bot upward melt. If Mr Market deems the jobs data this Friday as a 'goldilocks number'... then a weekly VIX close in the 11s looks highly probable. Thursday will see the usual weekly jobs data, but other than that.. not much else. Worse trade of the year? Disqus poster sutluc left a message for me yesterday evening, and brought up the issue of bad trades.. not least those by hitting the wrong option call strike/month (haven't we all done that at least once?). So.. EGLE did a restructuring... the shares saw a reverse split of 1 for 6... with some trading screens displaying the new higher price... but not adjusting the share count for a given trading account. Urghhhh. So much for Tradestation eh? Although I'd guess there is something in the T&C's to legally protect them from clients trying to claim its 'the brokers fault'. *in a related issue. 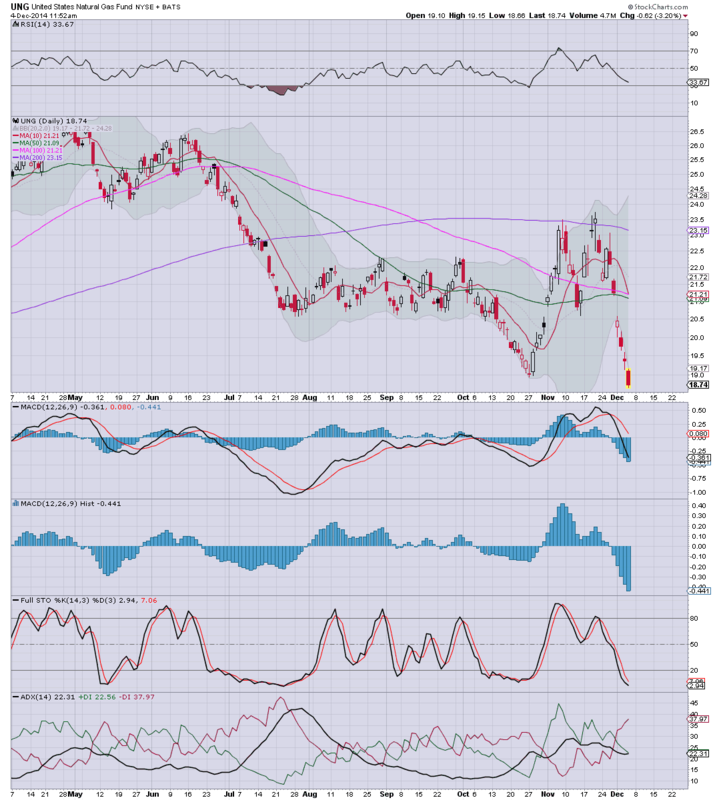 I certainly continue to keep an eye on Dry Ships (DRYS)... now set to lose the $1 level. A reverse split for that one also seems a given. The break into the 89s today was significant, and the USD looks set to break the March'2009 high of 89.11. After that, its the 92s from 2005. The giant 100 'basket' level looks viable next year. Armstrong - whom I closely follow, was earlier today alluding to the Feb' 1985 high of 164.72. That of course seems almost impossible, even given 4-6 years... but then.... we know the Euro is going to disintegrate, yes? We know the Japanese Yen is also going to near zero...yes? 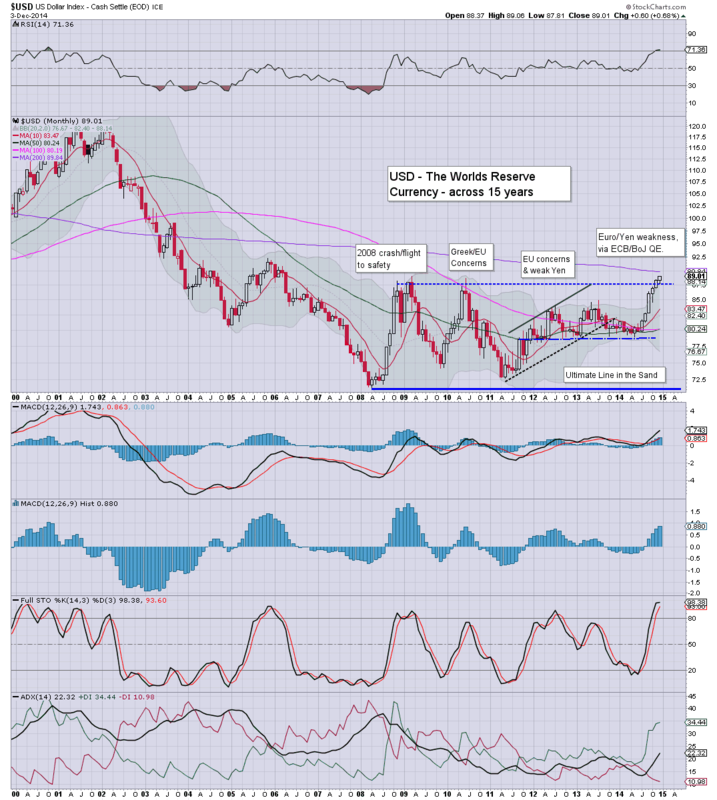 On that consideration.. a doubling in the value of the USD looks possible, but clearly... that is some years away. A closing thought... what will the dollar doomers (not least, Peter Schiff) say, if the USD continues to climb across next year?